MFA is a new party paying homage to all ends of the house & disco spectrum, inspired by the lights, sounds and sites from 1970s New York Loft Discos to modern day warehouse raves, MFA is the new disco party for girls, boys and everything in between. Boasting a lineup of Femaleresident DJs and Drag queens you’ll be taken on a journey of Funkadelic delights and Disco dancing into the early hours. 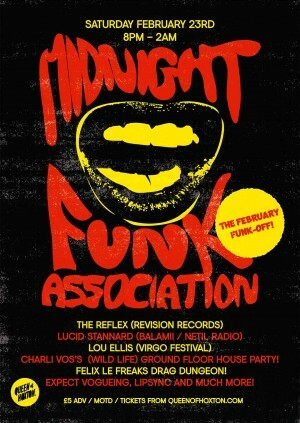 For our 2nd instalment, we have a mega line-up of deviant disco divas to play past midnight and into the early hours. First up is headliner and disco edit king, The Reflex! This guy is the real deal when it comes to classic disco, funk and soul edits - with the deftest of touches he turns the almost untouchable into dance floor gold - every, single, time. On the ground floor we have Queen of Hoxton residents DJ Charli Vos playing a mixture of party music to get your feet moving, as well as some dance classics and the usual party bangers you can always expect from Queen of Hoxton.